Christmas Themed Crochet Potholder - Red, White and Green Christmas Holiday Striped Potholder Worked in Afghan Stitch Crochet, With Cross Stitched Embellishments. 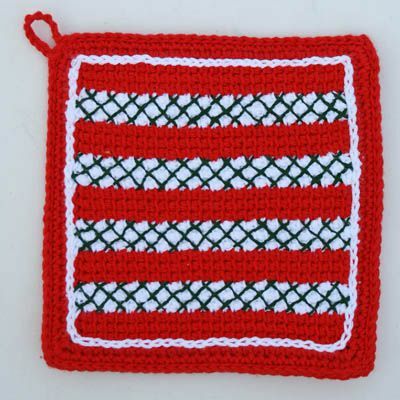 Photo © 2009 Amy Solovay, Licensed to About.com, Inc.
Use this free potholder pattern for making crocheted potholders in Christmas colors. These potholders are worked in afghan stitch and are embellished with cross stitched accents. Guaranteed to put you in a festive mood - bake your Christmas cookies, cakes and pies in style using these cheerful potholders, or crochet several sets to give as gifts to all the cooks on your Christmas shopping list. Potholders make excellent Christmas gifts! They work up relatively quickly, and they don't use much yarn, making them quite economical. For each potholder, you’ll need approximately 3 oz. of worsted weight cotton yarn total. You'll need yarn in 2 different colors: color A and color B, approximately 2.5 oz color A and about .5 oz color B. In the sample shown above, red is color A and white is color B. The sample was worked in Peaches & Creme 4 ply cotton yarn in red and white. Feel free to substitute any similar cotton yarn if you prefer. For the Body of the Potholder: You’ll need a size J / 10 /6.0 mm afghan crochet hook measuring 10+ inches long, or your preferred size. For the Edging: Try an ordinary size H crochet hook to start with; you may need to adjust up or down if you notice a significant difference in tension between the body of your potholder and your edging. Embroidery Floss: 3 skeins of dark green. The sample was made using DMC color 890. The potholders each measure approximately 8 ¾ inches square before washing. This measurement includes the edging. The potholders can be expected to shrink slightly when you launder them. 11 stitches = 3 inches. The row gauge isn’t critical for this project. Using color A, ch 27. Work in afghan stitch (also known as Tunisian simple stitch) until directed otherwise. Rows 1-3: Work in color A. Rows 4-6: Work in color B. Rows 7-9: Work in color A. Rows 10-12: Work in color B. Rows 13-15: Work in color A. Rows 16-18: Work in color B. Rows 19-21: Work in color A. Rows 22-24: Work in color B. Rows 25-27: Work in color A. Edging Round 1: Switch to your ordinary crochet hook. Work in rounds. Ch 2, then work one single crochet stitch in each stitch, all the way around. When you get to the corners: (sc, ch 2, sc in the same stitch) and then continue working sc. Join with a sl st. This Close-Up Photo Shows the Stitched Details of the Crocheted Christmas Potholder. Notice How the Stitching Is Worked Overtop of the Crochet in a Checkerboard Pattern. Photo © 2009 Amy Solovay, Licensed to About.com, Inc. Using green embroidery floss, cross stitch in a checkerboard pattern overtop of the stripes worked in color B. Using color B, work a round of slip stitches on the surface of the potholder. This gives some visual separation between the afghan stitch and the edging. Christmas Potholder Back View. Photo © 2009 Amy Solovay, Licensed to About.com, Inc.
Work 27 rows of afghan stitch in color A. Edging Round 1: Continue working in color A; there is no need to cut the yarn. Switch to your ordinary crochet hook. Work in rounds. Ch 2, then work one single crochet stitch in each stitch, all the way around. When you get to the corners: (sc, ch 2, sc in the same stitch) and then continue working sc. Join with a sl st.
Work one front and one back for each potholder you want to make. If you’d like to make a matching pair of potholders, you’ll need four squares all together. The final round of the edging is used to hold the two pieces of the potholder together. Ch 2 using color A. Place the wrong sides of the squares together. You want the face of the fabric, especially the decorated side, facing outwards. Be sure that you hold both the top edges together, as there is one stitch less on the top than the bottom. You might find it helpful to safety pin the corners of the squares to help you hold them together as you join them. Working through the front and back loops of both squares, work one single crochet stitch in each stitch, all the way around. When you get to the corners: (sc, ch 2, sc in the ch-2 corner space from previous round) and then continue working sc. At the end of the round, ch 10 to make the hanging loop for the potholder. Join the hanging loop to the body of the potholder with a slip stitch. Work 1 slip stitch in each sc all the way around. When you get to the corners, work a slip stitch into the the ch-2 corner space. When you’ve worked slip stitches all the way around the potholder, end off, leaving a tail of yarn at least 6 inches long. Weave in the end carefully using a tapestry needle. Your work will be visible, so be as neat as you can about it. This potholder is a variation of the easy afghan stitch potholders. If you'd like a simpler potholder pattern, or a pattern that is suitable for everyday use, that one is a good choice. These pretty afghan stitch potholders are another great choice for everyday use. To make one potholder, I used up close to an entire 2.5 oz ball of yarn in color A and much less than one ball of color B. Due to variations in the way each person crochets, you might use a bit more or a bit less than I did. If you're buying new yarn for this project, I'd recommend buying one extra 2.5 oz ball of color A to ensure that you don't run out of yarn. For example, if you want to make two potholders, I'd recommend buying 3 balls of color A. You might end up needing that third ball, or you might not, but it's better to have it on hand than to run out. If you end up not using that extra ball of yarn, you might be able to return it if you save your receipt. If this is a concern, check the retailer's return policy, and be sure to have the project completed within the time frame that returns are allowed. Make sure to use a colorfast embroidery floss. Vintage embroidery floss might not be colorfast. This is a concern because the colors could bleed when you wash the potholder. If in doubt, wet a small piece of the floss to see if it bleeds before using it. Afghan stitch has a tendency to curl up, so do not be alarmed if your work curls. The potholder will lie flat once you join the individual pieces together. Insert your hook in between the layers of the potholder, starting from a spot in the middle. Bring the hook up to the surface again in a spot that is really close to the tail of yarn. Grab the tail of yarn with the hook. Pull it through one layer of the potholder. Carefully extricate your hook, leaving the tail of yarn buried inside the potholder.